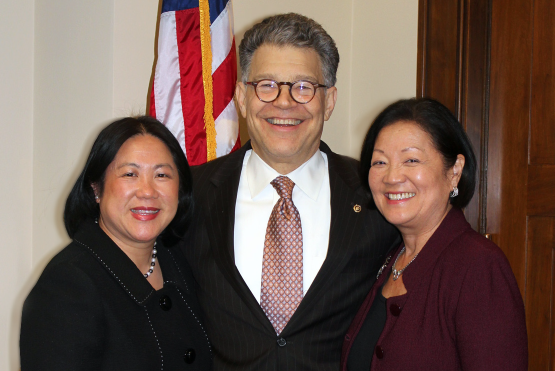 Sen. Mazie Hirono (right) of Hawaii with Sen. Al Franken of Minnesota and former Minnesota State Sen. Mee Moua at a March 2013 meeting on immigration reform. “Today, I am calling on my colleague Al Franken [D-Minn.] to step aside. I’ve struggled with this decision because he’s been a good senator and I consider him a friend. But that cannot excuse his behavior and his mistreatment of women. “Time Magazine, by naming ‘The Silence Breakers’ as their ‘Person of the Year,’ is recognizing what women have always known: there are men among us who use their positions of power and influence to manipulate, harass, and assault women. What is new here is the women. We are, all of us, speaking out, naming names and demanding that the harassers take responsibility for their behavior. “I am proud of each of the women who has come forward, and heartened by the changing climate that has received their stories with acceptance and compassion. “My hope is that this moment for a cultural change will result in women no longer being viewed as objects or toys, but recognized for their abilities and achievements. As regular human beings. Women have endured this behavior, which for too long has been ignored and tolerated. But no longer. As of Wednesday morning, 23 Democratic senators, 12 female and 11 male, had called on Franken to resign as allegations of sexual harassment continue to mount. The female senators include Kirsten Gillibrand of New York, Claire McCaskill of Missouri, Patty Murray and Maria Cantwell of Washington, Maggie Hassan of New Hampshire, Dianne Feinstein and Kamala Harris of California, Tammy Baldwin of Wisconsin, Debbie Stabenow of Michigan, Heidi Heitkamp of North Dakota, and Tammy Duckworth of Illinois. They were joined by Republican Sen. Susan Collins of Maine.